Is there a different way to design a tablet? If so, Asus is going to find it! Their new Android slabs are all special snowflakes—including the QWERTY keyboard-hiding, Tegra 2- and Android 3.0-equipped Eee Pad Slider. There will be tablets aplenty at this year's CES, and Asus's strategy is basically trying a bunch of different stuff and seeing what sticks. Which is commendable, in a way! They've got three Android tablets in their brood. The most intriguing? The Eee Pad Slider, a 10.1" tablet that hides a QWERTY keyboard a la the Dell Inspiron Duo. 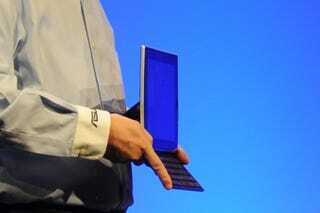 It'll run Android 3.0 Honeycomb and has an NVIDIA Tegra 2 processor. And, crucially, it's not gigantic! It's only half an inch thick, about the same as an iPad, and weighs 2.2 pounds, a bit more than the iPad. It's also got cameras on the front and back—1.2MP and 5MP with auto focus, respectively—and a mini USB port, a mini HDMI port, and a Micro SD card reader. They had a little trouble sliding this apart on stage, but it looks impressively thin considering its hidden keyboard. The Eee Pad Transformer, another presto-changeo tablet, also has the full keyboard—though instead of sliding like the Sliders, this one is detachable. The tablet part has the guts—a Tegra 2 processor, dual cameras (1.2MP and 5MP), and a 32GB SSD with 1GB of memory—though adding the keyboard doubles the battery life up to a reported 16 hours. This one, too, will have Android 3.0, though we'll see how well it pulls off the pad-mode/docked-mode balancing act. The Eee Pad MeMO measures up at a is-it-a-phone-or-is-it-a-tablet 7 inches, it's got a Snapdragon processor, 1.2MP and 5MP front and back cameras, and can make calls and send texts with a Bluetooth MeMic accessory. It's been optimized for use with a capacitive stylus, and Asus is showing off apps that take advantage of things like handwriting and drawing.